When you are working on any project having large database , then before applying new modifications you might need to take a backup of the current database. It might be possible that you receive an error while importing the large database because it exceeded the timeout. So, How to import large database in phpmyadmin? Well, there is one solution for this called "BigDump". When you are about to replicate or move a database then importing large SQL dumps can be difficult for those with only web access to the MySQL server. phpMyAdmin has certain shortcomings when importing files of more than a modest size. In such cases BigDump can be a helpful utility. 2. Extract the bigdump.zip file and open the bigdump.php file in a text editor. 3. Configure: Server, database name, username, password, and the file name. Recommended Reading : How to Decrease Page Loading Time? 4. 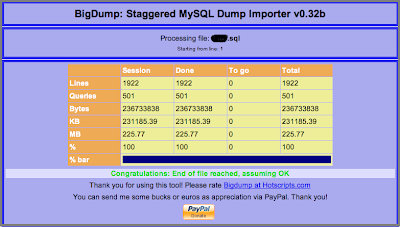 Upload both your SQL file and bigdump.php to the same directory on your webserver. You have Done It..!! Wait a few minutes and you will see a confirmation screen similar to the one below.